Attack on Bay Area Longshore Workers (October 2007). 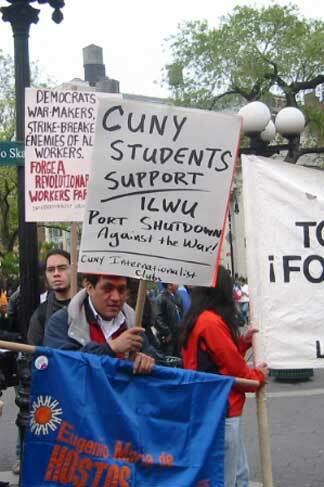 Teach-in/rally at Hunter College in New York in solidarity with ILWU port shutdown. Photos of Hunter rally by David Pavlosky. The following article is based on a report by a PSC delegate and supporter of the Internationalist Group. The May 1 West Coast port shutdown against the war by the International Longshore and Warehouse Union (ILWU) had an impact in New York City. The dock workers’ defiant action demanding immediate withdrawal of U.S. troops from the Near East was an inspiration to workers, students and all opponents of imperialist war – as well as an example to emulate. 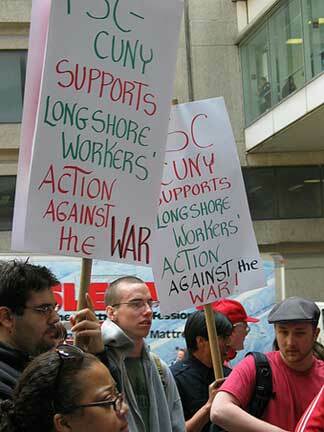 May Day events in solidarity with the ILWU action were held on eleven campuses of the City University of New York (CUNY) by chapters of the Professional Staff Congress (PSC), the union representing CUNY faculty and staff. These included rallies and teach-ins at Hunter College, Hostos Community College and Bronx Community College, a speak-out against military recruiters at Queens College, a march into Manhattan from NY City Tech, and tabling at several other units of the largest urban public university in the United States. John pointed out that the PSC’s support for the dock workers’ historic action against the war on Iraq and Afghanistan is “very strongly connected to building a strong union and our ability to fight for anything.” Film professor Tami Gold, a noted documentary filmmaker and incoming chair of the Hunter PSC chapter, pointed out that faculty pay at CUNY had fallen by 27 to 51 percent in recent years as salaries failed to keep up with inflation. The PSC has been working without a contract since last September, while adjuncts continue to get poverty-level pay. The Hunter rally drew support from labor and immigrant groups that sought a concrete way to express solidarity with the longshore workers’ port shutdown. In addition to the New York Taxi Workers Alliance (a largely immigrant group that carried out an important strike last fall), the event was endorsed by NYC Labor Against the War, UFTers Against the War, New Immigrant Community Empowerment and others. Organizers at Hunter had to contend with vindictive campus administrators who told police to deny a sound permit for the outdoor rally/teach-in. They even sent cops to prevent use of a bullhorn. Police barricades deterred some from joining in, although scores crowded into the plaza to hear and participate. Altogether about 120 people attended. 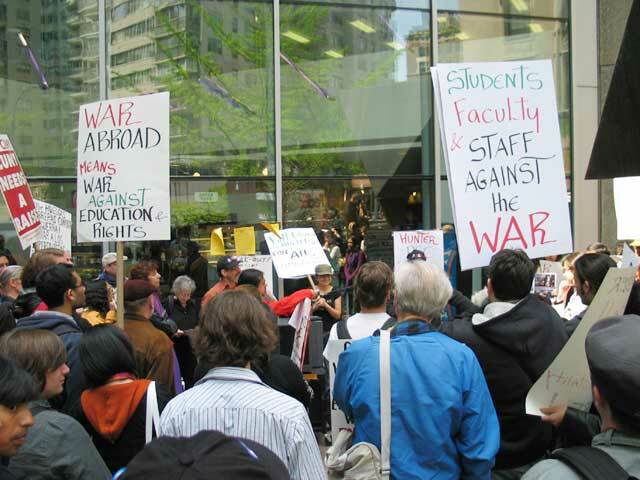 Students responded with vigor to joining with the power of labor on the international workers day, particularly this May Day as the first labor strike against war in U.S. history was being carried out. “Workers strikes against the war!” the crowd chanted. Several reports were relayed during the three-hour event from the West Coast dock workers’ port shutdown and march in San Francisco. Outgoing Hunter PSC chapter chair Mike Perna read a lyrical description of the different West Coast ports that had been closed by union action. PSC vice president Marcia Newfeld read a letter from Iraqi dock workers announcing their shutdown of two ports in solidarity with the ILWU action and against colonial occupation. Participants got a history lesson on the 1934 San Francisco general strike that established the ILWU, about the police murder of three unionists in their attempt to break the longshore strike, on the union hiring hall that has enabled the West Coast dock union to stand strong against racism, xenophobia and McCarthyite witchhunting against “reds on the docks.” The ILWU’s refusal to load ships for the Chilean dictatorship, the Salvadoran junta and South African apartheid butchers was cited. The history of May Day was recalled going back to the judicial frame-up and execution of the Haymarket martyrs, in an attempt to break the 1886 strike by tens of thousands of immigrant and U.S.-born workers fighting for the eight-hour day. This was linked to recent events, particularly the acquittal of the NYPD killer cops who gunned down Sean Bell in a hail of 50 bullets on his wedding day in Queens. There were faculty speakers from the Anthropology, English, History, Media Studies, Philosophy, Sociology, Romance Languages, Urban Planning, Women’s Studies and other departments at Hunter. Speakers told of the role students played in the 1968 Columbia University revolt and in the May-June ’68 worker/student revolt in France on the 40th anniversary of those events. A professor from Brooklyn College gave some history of the Iraq war, and drew lessons from the workers’ revolt against World War I in Germany. A representative of the New York Metro Area Postal Union told of the solidarity with the ILWU antiwar port shutdown by postal unions here and in other cities. A speaker from the Welfare Rights Initiative linked organizing among welfare recipients to the struggle for women’s rights, to defend public education and against the war. A central theme was the fight for immigrants’ rights, particularly as immigrants mobilized around the country on May Day. Antonio, a rank-and-file member of the Taxi Workers Alliance and supporter of the Internationalist Group, told the Hunter rally: “The attack on immigrants also means attacks on workers born here. Look at what they’re doing with driver’s licenses and the push for a national ID card. 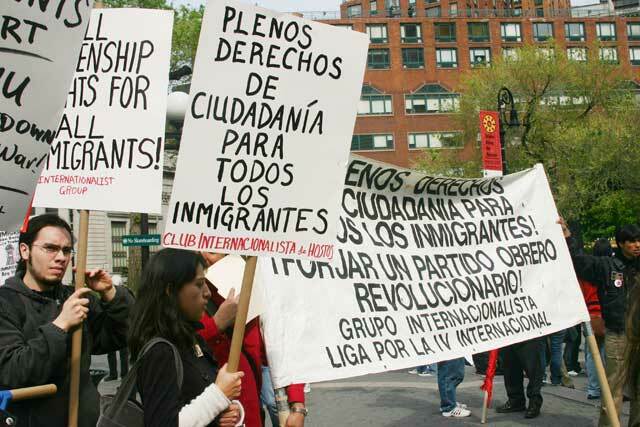 As an immigrant worker, I link the struggle for full citizenship rights for all immigrants to the fight for labor rights and to the fight to defeat imperialist war. I link it to the fight against the oppression of black people in this country, which is key to the class struggle. We see it in the Sean Bell case, and in the fight to free Mumia Abu-Jamal,” the radical black journalist and former Black Panther on Pennsylvania’s death row. There was controversy as well. One professor said speakers were too hard on the Democratic Party, while another urged rally participants not to engaged in “sectarian radical approaches.” The rally chairman responded with examples of how both Republicans and Democrats had used the anti-labor Taft-Hartley and Taylor laws against labor, speaking of the 2005 NYC transit strike, about Democratic president Bill Clinton’s ending of “welfare as we know it,” as well as his attacks on the right of habeas corpus, of the votes for the war budget of candidates Hillary Clinton and Barack Obama. A philosophy adjunct professor spoke about how imperialism works. Mid-way through the Hunter rally, protesters were joined by a group that had come from the solidarity rally at Hostos Community College in the Bronx. There, the speaker from the Hostos Internationalist Club spoke of the USA PATRIOT Act, of the police murder of Sean Bell, and of the “migra persecution of hundreds of thousands of immigrant workers and their families, carrying out raids in their homes and workplaces with semi-automatic weapons, sniffing dogs, helicopters and an arsenal that would make Rambo blush.” The speaker noted that the wave of anti-immigrant laws began under Clinton, calling to break with the Democrats and form a revolutionary workers party.